When the Milky Way consumes another galaxy, tendrils of stellar streams survive the merger, containing clues about the universe’s mysterious unseen matter. The stellar stream known as GD-1 is a thin flow of material tucked inside the Galactic halo, the loose collection of stars and gases surrounding the disk of the Milky Way. Using data released last April from the European Space Agency’s Gaia space telescope, which is in the process of assembling the most detailed map of the Milky Way’s stars ever made, astronomers were able to use precise positional data to reconstruct the movement of the stars in GD-1. Torn from a cloud of material, the stream is the last remnant of an object that was likely consumed by our galaxy in the last 300 million years—an eyeblink on astronomical timescales. Gaia found two small breaks in the stream, the first unambiguous observation of gaps in a stellar stream, as well as a dense collection of stars called a spur. Together, these features suggest that a small but massive object shook up the material of the stream. “I think this is the first direct dynamical evidence for the small-scale [structure] of dark matter,” says Adrian Price-Whelan, an astronomer at the Flatiron Institute in New York. Working with Ana Bonaca of the Harvard-Smithsonian Center for Astrophysics, Price-Whelan investigated the newfound structures in GD-1 to determine their source and presented the results earlier this year at the winter meeting of the American Astronomical Society. At about 33,000 light-years (10 kiloparsecs), GD-1 is the longest stellar stream in the galactic halo. While Price-Whelan and his colleagues were able to use models to show that one of the gaps formed during the generation of the stream, the other gap remained a mystery. However, along with the puzzle, Gaia also revealed a solution: the spur. When an object travels past or through a stellar stream, it disrupts the stars. Price-Whelan compares the disruption to a strong jet of air blowing across a stream of water. The water—or stars—plume outward along the path of the disruptor, creating a gap. Some move so fast that they escape the stream and go flying off into space, lost forever. Others are pulled back into the stream to form eddy-like features astronomers call spurs. After a few hundred million years, most spurs merge back into the stream, and only the gap remains, though some can be longer-lived. When it comes to spotting structures in stellar streams, Price-Whelan calls GD-1 “the Goldilocks stream” because it’s in just the right place. GD-1 is within the stars of the Milky Way, but moving in the opposite direction, making it easier for astronomers to pick out the stars in the stream from the surrounding objects. “At any given location, it’s moving differently from the way most of the other stars in that part of the sky are moving,” Price-Whelan says. The researchers modeled what type of objects could be responsible for the relatively newborn spur spotted in GD-1. They determined that the responsible object had to weigh in with a mass somewhere between 1 million and 100 million times the mass of the sun. Stretching only about 65 light-years (20 pc) in length, the object would have been incredibly dense. The interaction between the stream and the dense object would have likely happened within the last few hundred million years out of the 13.8-billion-year lifetime of the universe. Dark matter isn’t the only object that could have disrupted the stellar stream. A globular cluster or dwarf galaxy swooping nearby could also have created the gap and spur. Price-Whelan and his colleagues turned their eyes toward all known such objects and calculated their orbits, finding that none came close enough to GD-1 in the last billion years to shake things up. A chance encounter with a primordial black hole could have sent the stream’s stars flying, but it would have been an extremely rare event. 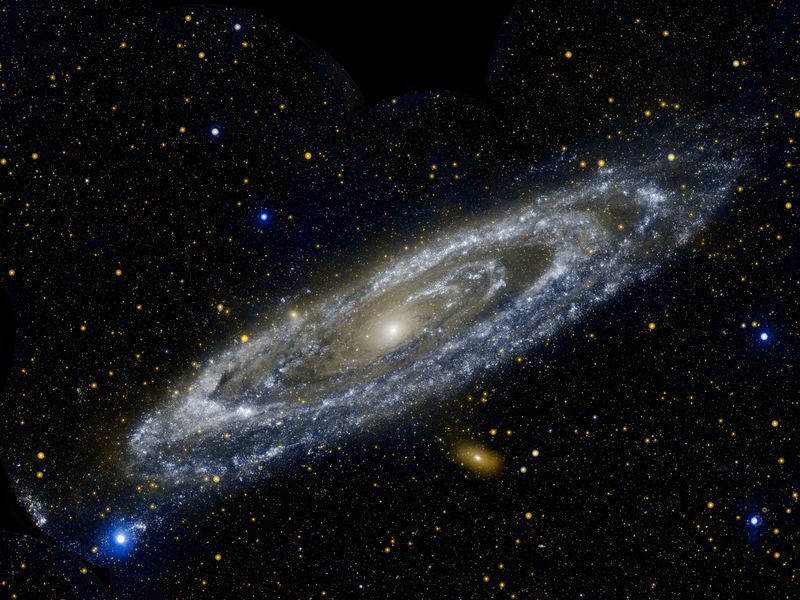 According to dark matter simulations that allow for small structures, scores of dark matter seeds are scattered through galaxies like the Milky Way. A stream like GD-1 is expected to encounter at least one such seed within the last 8 billion years, making dark matter a far more likely perturber based on encounter rates than any other object. Dark matter makes up the bulk of the mass in the universe, but it has never been directly observed. The two leading theories for its existence are the warm dark matter model and the Lambda cold dark matter model (ΛCDM), which is the model preferred by most scientists. Under ΛCDM, dark matter forms clumps that can be as large as a galaxy or as small as a soda can. Warm dark matter models suggest that the material has less massive particles and lacks the can-sized structures that the ΛCDM model suggests. Finding evidence for small scale structures of dark matter could help weed out certain models and start to narrow in on some of the characteristics of the tantalizing stuff. Gaia’s data helped identify the stars of the spur, but it’s not detailed enough to compare the velocity differences between them and the stars in the stream, which could help confirm that dark matter perturbed the structure. Price-Whelan and his colleagues want to use NASA’s Hubble Space Telescope to further study the movement of the faint stars in GD-1. Although Gaia has opened the door to wide-scale examination of the movement of stars across the Milky Way, Price-Whelan says that it can’t compete with the HST when it comes to very faint stars. “You can drill much deeper when you have a dedicated telescope like Hubble,” he says. The differences in how the stars of the stream and spur move could help astronomers determine how much energy the perturbing object carried, as well as allow researchers to calculate its orbit. These pieces of information could be used to track down the disruptive dark matter clump and study its immediate environment. In addition to making a more in-depth study of GD-1, astronomers plan to apply the same techniques enabled by Gaia’s data to some of the more than 40 other streams surrounding the Milky Way. Spotting spurs and gaps in other streams and tying them to dark matter could further improve our understanding of how the mysterious substance interacts with the visible galaxy. After decades of puzzling over the mystery of dark matter, the gaps and spurs in stellar streams like GD-1 may finally help to reveal the secrets of the substance that makes up most of the universe. “This is one of the most exciting things that has come out of Gaia,” Price-Whelan says.